Local search has changed dramatically in the last decade. Gone are the days when you could buy a generic database from a mailing list provider, slap maps on it and have a local search solution. Social networks, mobile phones and businesses themselves are changing and enriching local search. Yelp and foursquare's mobile apps allow users to add photos. The best local search databases are content rich. They include attributes such as hours of operation, friendliness of the place to kids and pets, whether there is outdoor seating, etc. Many of these attributes are collected by users themselves. Increasingly, this is being done on mobile phones — people can update data before they’ve even left the place. Users also help to maintain the quality of the databases. In my research, there wasn’t a single case where Yelp or foursquare didn’t have a place I was looking for. There were quite a few that I couldn’t find in Google Places and Facebook. For the U.S., the best database of restaurants and bars is at Yelp. New places are often in Yelp’s database as soon as the place opens. (Sometimes even before the official open, as people participate in friends and family dinners and soft launches.) Foursquare’s data are also comprehensive, but are cluttered by users who try to exploit the service’s game mechanics by creating extraneous venues. Photos are key components of some of these databases. The growth of smartphones will only further this trend. 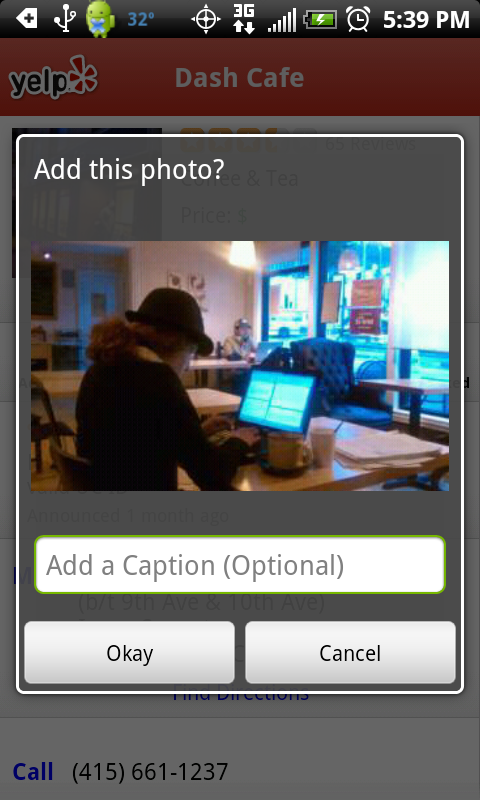 Some venues on Yelp have a hundred or more photos. Yelp reports that its users are uploading a photo on average once every 30 seconds. Foursquare recently introduced photos. Google is sending professional photographers out to take pictures of top places. Specialized applications like foodspotting have small but loyal audiences who upload pictures of specific dishes at restauranst. When it comes to mobile data collection, Google’s Hotpot is weak. New places can’t be added and photos can’t be uploaded. It supports ratings, reviews and identifying problems such as closed businesses and duplicate venues. But providing tools isn’t enough; it’s important to provide the right incentives. Yelp has done a great job of providing ordinary users incentives to contribute to the maintenance of its database. It uses both social reinforcement and more tangible rewards. Yelp makes it easy for members to thank and compliment each other for reviews. Selected reviews are featured in weekly newsletters. Review often enough and you become a Yelp elite and have a badge on your profile. Yelp employs community managers in its markets to help reinforce the community. Frequent events (including Yelp-hosted parties) provide more incentives to review and create adhesion among the community. Only a small proportion of the Yelp user base does any of these things. But you only need 1 person to provide value to millions. Yelp’s dedicated, engaged user base will be a significant barrier to other competitors in the space. A snippet from a business list in Portland. Beers on tap at Beachwood BBQ. Click the image for a live version. This sort of real-time information can help sway a decision or prompt users to go out on a night when they would otherwise have stayed in. Radio Room in Portland does a great job of this with their Twitter feed. The image to the right is an image from the Hops Cam at Beachwood BBQ in Seal Beach, Calif. It allows users to instantly see what’s on tap now. What spot now?, an iPhone app, allows users to see real-time cameras from various restaurants. Although Google, Yelp and foursquare allow businesses the opportunity to claim their page, there is no mechanism to communicate with customers through their platform. Businesses are claiming pages and providing enhanced attribute information. Nearly 2/3 of businesses I looked at have claimed their Google and Yelp pages. This screenshot shows a recommendation in Hotpot based on other places I've rated. To date, no one has done a great job of making recommendations based on a user’s preferences or social network. Local search has required users to sift through mounds of data or just go for serendipity (like in UrbanSpoon). Yelp and foursquare have had some form of social recommendations. Both will highlight recommendations from friends, but their social graphs haven’t been large or relevant enough. This is a key focus area for Google Hotpot. 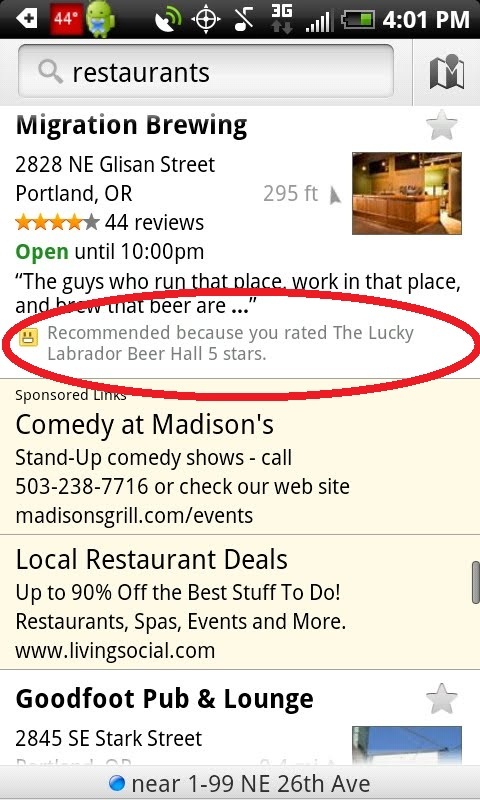 When you do a search, you might see recommendations based on other places you’ve rated. Or you might see that a friend has rated the place. Unlike recommendations from strangers, this provides immediate context. I know some friends whose tastes are similar. If they like a place, I know the chances are good that I will like a place. Negative affinity can be helpful, too. There are a few people whose tastes are so divergent that I know not to go someplace they rate highly. Pictures also play a big part in decision making. Local search has long relied on textual data because it’s been easy and available. But visuals are a key part of the experience when it comes to dining and nightlife. They can answer questions like “Is this place fancy or a dive?” and “Would this place be a great place for an anniversary dinner?” much quicker than text reviews can. See Picturing a new vision for local search. Pictures are also much easier to go through on a mobile device. Making intelligent recommendations requires having a lot of data. The easier you can make it, the more participation you will have. Few people will go through the trouble of writing detailed reviews, but 1-click ratings can provide important signals and will have a higher participation rate. See more on recommendation engines for local search. No matter how good your content is, it doesn’t matter if you can’t get it in front of people. Here, Google has an indisputable advantage. Google sites serve 170 million people in the U.S. Yelp reaches 26 million. (Many of these come through the help of Google’s search results.) Foursquare claims several million downloads. The difference in scale is enormous. Google’s distribution advantage extends to mobile with prominent applications on iPhone and deep integration within the Android OS. Facebook is also a large player here, with more than 150 million unique mobile users worldwide. When they set their eyes to local, they will be a big player to watch. Step 1: Person A looks up a place on a local search site. Step 2: Person A sends the place name via SMS to Person B (and C, D…). Step 3: Person B gets the text message and looks it up in a local search site to find the address and look up information. Step 5: Person B then uses the site to generate driving directions. This could be greatly simplified. Again, Google’s deep integration into Android provides an advantage. Person A could find and text the place information. The receiving phone would identify that the link is specially formatted and instead of presenting it at as an SMS, would present a Places page with pictures and reviews and an accept/reject button. Such sharing could also help Google build out a social graph.